In small bowl, mix Sauce ingredients; set aside. In large bowl, mix Slaw ingredients; set aside. Place flour in medium bowl. In another medium bowl, beat egg and 1 tablespoon soy sauce. Place bread crumbs in shallow bowl or pie plate. Dip pork chops into flour; shake off any excess flour. Dip pork into egg mixture, then dredge in bread crumbs. Discard any remaining flour, egg mixture and bread crumbs. In 12-inch skillet, heat oil over medium-high heat until very hot. Reduce heat to medium. Cook pork chops in oil 4 to 7 minutes, turning once, until breading is golden brown and meat thermometer inserted in center reads at least 145°F. Serve pork with sauce, slaw and rice, if desired. 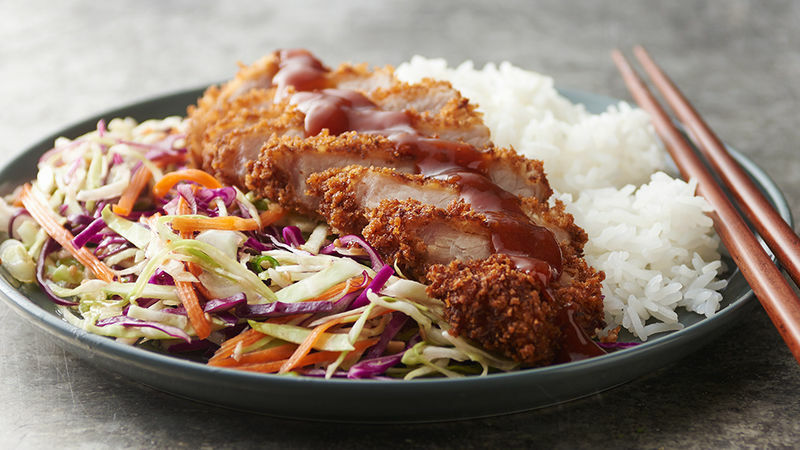 For the tastiest, gristle-free tonkatsu, be sure to trim the fat from pork chops before breading. Not sure your oil is hot enough? Drop a piece of bread crumb into the oil. If the oil bubbles enthusiastically, you’re free to fry!